Seaside Santa Monica offers pet-friendly travelers an ocean of options and Los Angeles proper pulls out all the stops and welcomes pet-visitors with red-carpet treatment. Join Janine & Beau as they share the best pet-friendly places in Los Angeles and mingle with the stars! Within walking distance of our preferred pet-friendly hotel, (The Fairmont Miramar Hotel & Bungalows) you will find Cezanne, 1740 Ocean Avenue Santa Monica, (310) 395-9700. Cezanne is located inside the luxury beach front hotel, J.W. Marriott and serves fabulous menu items with French Flair. Open for breakfast, lunch and dinner daily with a delightful outdoor patio that is pet-friendly. Bone appetite! So many shops, so little time. Make sure to visit Bark Williams, at 2901 Ocean Park Boulevard in Santa Monica. This is a pet-specialty shop with one of our favorite things…a self wash dog wash! You and the pup can go to the beach, get all sandy and salty, and head over to Bark Williams to spiff up before returning to your hotel…so much good clean fun! The pedestrian mall on 3rd street is also a fantastic place to walk and shop with your pet. Most stores here are pet-friendly and there are live sidewalk entertainers to keep it interesting. Restaurants will ask you to tie your pup up to the fence surrounding the outdoor dining areas, but if you plan it well you will be able to find a table on the edge and you can tie the leash right next to you. This is where you can mingle with the ‘stars’! Hit the rooftop venue SKYBARK with your pup for a cocktail party to like no other! Rhinestone clad leashes, all the hippest pet fashions and the ‘beautiful’ people sipping libations; SkyBark offers a wonderful outdoor/rooftop venue for movie premieres, fashion shows, and special events for you and your pup to attend together. Check their website if you are going to be in the Los Angeles area for upcoming events, usually open to the public! Something you may want to pre-order online prior to your trip is the Pet Lovers Publication - Los Angeles. This is a fantastic handbook showcasing all things pet in Los Angeles, CA...pet-friendly restaurants, hotels, pet services, dog beaches and a wonderful guide with a map to area dog walks. With this guide in your pup’s backpack you’ll both be well informed. 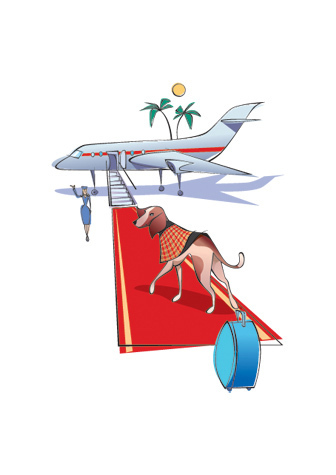 There are many reasons that the Fairmont Miramar Hotel & Bungalows, has become one of our favorite pet-friendly hotels. Very close to downtown LA but a serene world away the Miramar elevates pet-friendly lodging to an unprecedented level. The accommodations define sumptuous, relaxed elegance and the pet welcome amenity left nothing to chance. It included a silk tufted pet bed, a box of pet confections from one of Beau’s favorite places; the Three Dog Bakery, so perfect in its presentation that you would think they were spectacular bon bons and not pet treats at all, bottled water, food and water bowls with a slip proof placemat and a very thorough listing of area pet-friendly restaurants, resources, vets, and activities. Although, as wonderful a presentation as that was, it wasn’t until we stepped into the gorgeous marble bathroom that we were absolutely awed by the attention to detail and the desire to make their pet-guests feel truly welcome when we noticed that Housekeeping had taken the time to spell out Beau’s name along the rim of the bathtub in two inch tall pastel sponge letters.